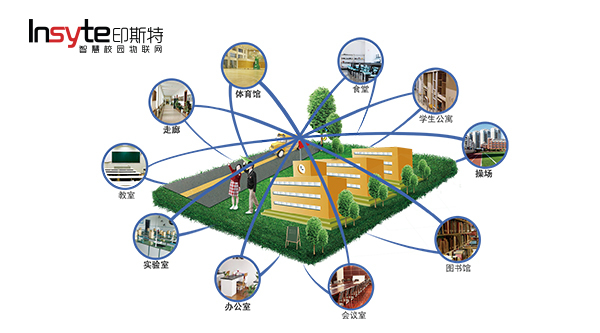 In recent years, education equipment industry has become a significant mark of measuring the development level of modern school, which boosts the informationalization of education industry. However, the challenge we face is how to combine different devices and systems to make it easier for controlling and administrating. Under the circumstance, Insyte Smart Campus IoT Solution designed by Xiamen Intech comes into being. Insyte Smart Campus IoT Solution makes full use of computer technology, sensor technology, network technique along with intelligent control technology, allowing for realizing interconnectivity between numerous devices and systems, and establishing platform. Consequently, it is possible to build a smart, safe as well as comfortable campus and form an energy-saving, environmentally friendly smart campus integrated management mode. Now, we’d like to share you how smart this solution is. Based on the design philosophy of "ease-to-use", Insyte Smart Campus IoT Solution firstly introduces the concept of "Smart House" to provide an integrated solution for clients in the terms of offering smart class, humanized office, cozily decorated apartment, neat dining hall together with safe outdoor environment. 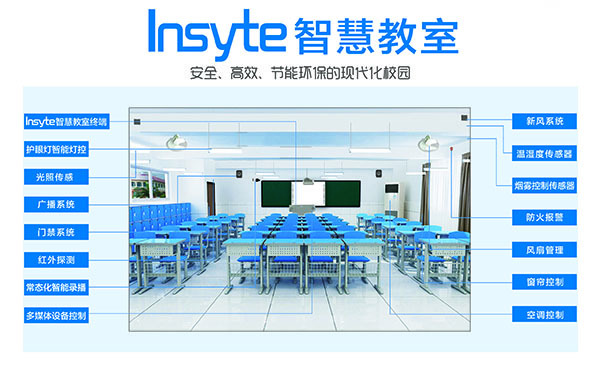 Insyte Smart Campus IoT Solution consists of several subsystems encompassing multimedia network intelligent central control system, intelligent power management system, intelligent lighting and eye protection solutions, intelligent recording system, digital campus broadcasting system, digital access control & time attendance system, environmental sensing & control system, fresh air system and so forth. It combines all the departments and subsystems to establish a platform to overcome the shortcomings of outdate information, insufficient human resources and wasteful resources. Furthermore, it has ability to cut down or add some subsystems according to the need of clients so as to construct the most suitable solution for clients. In addition, Insyte Smart Campus IoT Solution has a great advantage in regarding of compatibility and expansibility because it allows users to adjust their solutions accordingly for more efficient in construction. The original objective of Insyte Smart Campus IoT Solution is to provide clients with smart administration. Hence, it obviously integrates with various advanced information techniques involving cloud computing, Internet of Things along with wireless sensor, etc. to build a smart sensor environment and integrated information service platform that tends to be applied to all kinds of areas on campus. Meanwhile, it’s able to offer different schools personalized solutions that are in accordance with the specific circumstances of each school and meet the requirements of administrators, teachers as well as students. At aspect of daily administration, this solution is able to control locally and remotely, realize sub-regional management, operate one or more scenes simultaneously and can add new project accordingly so as to cut down the cost of infrastructures, improve security of devices and decrease the consumption of energy. When it comes to the whole management mode of campus, Insyte Smart Campus IoT Solution can set a variety of control modes such as coordinated control, scene control, timing control and remote control, which greatly improve the administration efficiency, reduce human resource costs and help users manage campus easily. It is very crucial to construct a better teaching environment for improving the efficiencies of teaching. In this case, Insyte Smart Campus IoT attaches much emphasis on humanization. In light of Android system controlling platform, each class is equipped with intelligent terminal that is compatible with traditional central control mode, and features high security, easy to install and lower maintenance cost. In the end, it is easy to control a wide range of electronic devices in the multimedia classroom. As for the software, teachers can benefit a lot from it as it allows for scenes setting and intelligent linkage to help teachers regulate classroom. Before teaching, educators can use a card to open the door of classroom and automatically log in system. The environment sensors system has ability to force the electronic curtain, air condition, fax and fresh air system to work according to the feedback of temperature, humid, brightness and air quality. Hence, teachers and students are possible to enjoy a healthy, comfortable teaching and learning environment. On the other hand, educators are capable of quickly starting their teaching tasks as long as they press the button to choose the following teaching modes like multimedia teaching mode, general teaching mode, activity mode, independent learning mode, quiz mode and so on that have been typed into the system in advance. It is so stunning that teachers can effortlessly take advantage of all kinds of teaching devices while improving the efficiency of class. Relying on innovative R&D team, adhering to the design philosophy of “ease-to-use”, Insyte Smart Campus IoT Solution boasts advanced techniques, reliable quality, expanded coverage, strong compatibility and ease for use system, which makes it possible to promote diversity integrated solution, furthermore, to stand out in the field of construction of smart campus.